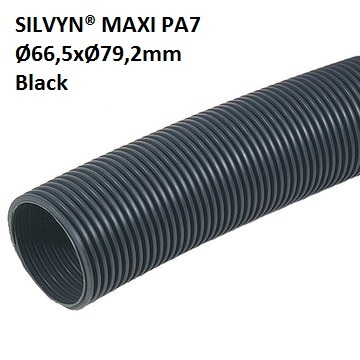 SILVYN® MAXI PA7 Ø66,5xØ79,2mm Black | DamenCNC B.V. This conduit SILVYN® MAXI PA is made of high quality, thick walled, parallel corrugated polyamide, halogen free as well as compression-, oil and acid resistant. Suitable connections flange are SILVYN® AFG-PA und AFW-PA. By using of the seal SILVYN® gasket AFG-PA / AFW-PA the protection class can be increased up to IP 66. Appropriate for use in machine- and plant manufacturing in acc. to EN 60204.